Welcome and thank you so much for taking an interest in Westlake Watersports Kids Camp The Most Exciting Summer Kids Camp In The County! We are so happy to be able to offer a very well structured program and so much fun-filled activities for such a reasonable price. We at West Lake Watersports Kids Camp want as many kids as possible in Prince Edward County, Picton and the Belleville Ontario area to experience this amazing fun filled summer day camp, create life long-lasting memories and make some new friends! The kids will enjoy pontoon boat rides to the dunes for fun and play, treasure hunts, a FREE pizza party on Wednesday, lots of play at Westlake Willy Waterpark, stand up paddleboards, kayaking, fishing, crafts, movies, life skills and Jet Ski ( Sea Doo ) rides! Hurry and sign up fast space is limited. 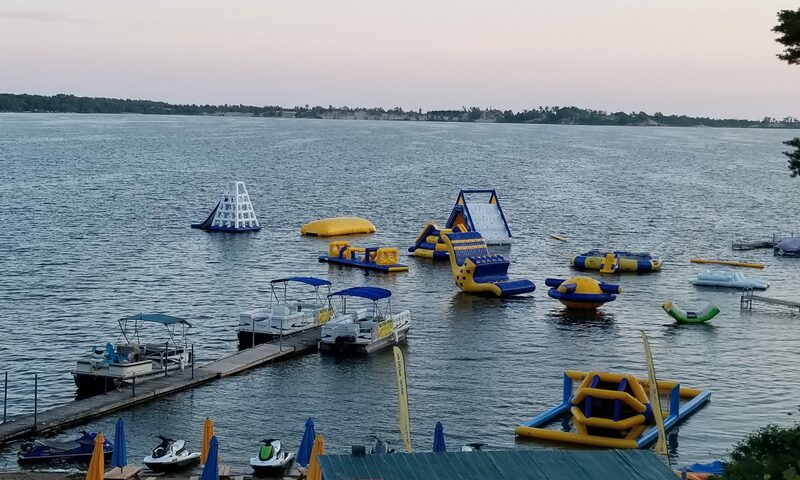 New for the 2018 West Lake Watersports Kids Camp summer day camp season, Trampoline, Giant Iceberg is comming back, Obsticle Ball Course, The Revolution, A Trampoline and Rope Swing, and Walk on Water Balls!! We are also offering the Belleville shuttle service every week! children who live in Belleville can now attend Westlake Watersports Kids Camp, so if you live in Belleville please book online and reserve your spot on the shuttle service from Belleville (Zwicks Park). NEW WATER TOYS COMMING THIS YEAR! OUR MOTTO IS TO ” PROVIDE AN OUTRAGEOUSLY FUN FILLED WEEK OF WATER ACTIVITIES COMBINED WITH ON LAND ACTIVITIES CREATING FRIENDSHIP AND MEMORIES TO LAST A LIFETIME”. WE PROVIDE JETSKI RIDES, PONTOON BOAT RIDES, KAYAKING, STAND UP PADDLEBOARDS. TRIPS TO THE SANDBANKS DUNES, LOADS OF FUN IN WESTLAKE WILLY WATERPARK, FISHING, TREASURE HUNTS, CRAFTS, BEACH BBQ OR PIZZA PARTY AND SO MUCH MORE!!!! ALL FOR $199.00 PER WEEK FOR YOUR CHILD. AGES 6-12. OUR CIT Program ( Counselor In Training ) ONLY $99.50 PER WEEK 12+yrs. WE ARE LOCATED AT EDGEWATER FAMILY CAMPING RESORT IN PRINCE EDWARD COUNTY..JUST 5 MINUTES FROM SANDBANKS PROVINCIAL PARK. The Picton Shuttle bus service will be picking campers up at 8:15 am and dropping them off at 4:15 Mon to Fri every week this summer from The No Frills in Picton. It is only $199.00 (per week camp & 45.00 for the shuttle service) we look forward to hearing from you!! The shuttle will be running from Belleville every week this summer!! Please book online for the weekly Belleville Shuttle Service Will Be Running Every Week This Summer Thanks For All The New Campers From Belleville!! Westlake Watersports Summer Kids Camp Runs 5 Days A Week Including Both Long Weekends!! WE WILL BE OFFERING OUR OVERNIGHT CAMPING ON TUESDAY NIGHTS THIS YEAR!! AND OUR COUNSELOR IN TRAINING PROGRAM 13+ YRS ONLY $99.50 PER WEEK!! ( Please call 613.393.1095 to register for the CIT program) PLUS KAYAKING STAND UP PADDLEBOARDS AND THE NEW WALK ON WATER BALLS!! The CIT Program (Counselor in Training). This new and exciting program in its second season offers older children to participate in Westlake Watersports Kids Camp program and give our instructors a helping hand and enjoy all the benefits of a great watersports kids camp!! This program is only $99.50. Please book early as spaces are limited! Please Call 613.393.1095 to register for the CIT program. The campers will now be able to enjoy the sport of Kayaking on beautiful Westlake. We will be spending two mornings a week participating in Kayaking. If you live in Belleville and want to take advantage of the CIT program and utilize the shuttle service please contact us at 613.393.1095. The overnight camping was such a hit last summer that it will be imbedded in the program permanently. The kids will learn to set up tents, start a campfire, cook dinner on the open fire, enjoy a late evening swim and more waterpark fun. The Campers will then retire to a campfire of yummy smores, sharing their highs and lows and of course creating lots of memories! Snacks, hat, sunscreen, anti bacterial gel, outdoor shoes, Crocks (pool shoes) for getting wet in, swim suit, towel, water bottles, bug repellant, life jacket (rental available please inquire), and a BIG SMILE! Must bring own lunch four out of five days (beach BBQ lunch provided Wednesday). Please remember “pack in, pack out” is our lunch policy. All garbage and recycling will be sent home. Westlake Watersports Kids Camp only hires the most experienced and qualified staff for all their Day Camp Programs! • All staff have clear Criminal reference checks, including vulnerable sector screening. • Supervision by both a full-time Program Supervisor and a Summer Day Camp Coordinator. Camps have a Senior and Junior Leader. • All staff are CERTIFIED in Standard First Aid and CPR ‘C’. • Staff participates in a week-long intense training session. • Most Senior Leaders are studying and/or graduates in the fields of: Child & Youth Worker, Social Service Workers, Early Childhood Education and Teachers. • All staff have extensive experience working with children. We cannot ensure an allergen free environment. We are, however, AWARE when we are notified that a child in camp has an allergy. We encourage parents to pack allergen free snacks and lunches for the safety of all campers and/or share spaces. All toys, electronics, or sentimental items, which could cause distraction or conflict amongst campers to be left at home. We are not responsible for lost, stolen, or damaged belongings. To ensure that all campers have the opportunity to play and grow in a positive space, we cannot tolerate negative camper conduct. Campers will be informed of ourRIKE POLICY and it will be applied equitably to all situations. It is our intent that this system will allow our campers to feel comfortable and secure during their time at Camp, while reinforcing respect for themselves and others. Westlake Watersports Kids Camp staff are legally obligated to observe the terms of the Ontario Child and Family Services Act and must report a child in need of protection.